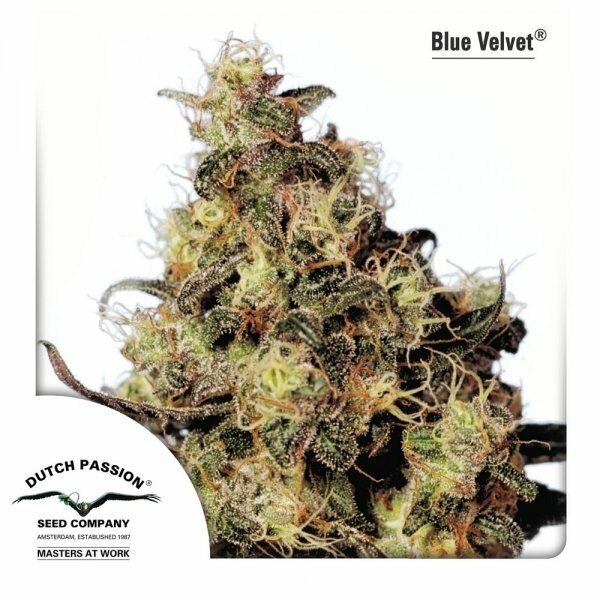 The feminized Blue Velvet by Dutch Passion is back - after years of hibernation in the gene-cellar the sister of the famous Blueberry has been re-created from seed stocks from way back in the 1990s. She is a small plant with its 50-60cm height but she produces beautiful resinous buds and boasts with a fruity floral taste and an uplifting and euphoric high. Highly recommended old classic. After many years of hibernation in the gene-cellar, Dutch Passion has resurrected the sister of the famous Blueberry - Blue Velvet. Using seed stocks from way back in time (1990s), they re-created this powerful 50-50 Sativa/Indica hybrid. Her genetic background sounds like a trip around the world: Purple Thai (a crossing of a special Chocolate Thai and Oaxaca Gold) and a powerful Afghani Indica. Although a half-caste, she tends to show more of her Indica legacy - the plants remain rather short (50-60cm, perfect for the SOG method), but produce beautiful buds with ample amounts of resin. Blue Velvet, feminized, by Dutch Passion is not only a treat for indoor cultivation, where it takes her only 8 weeks to flower - when grown outdoors, the plants can reach a height of 2-3m and occasionally show the special feature of Blue Velvet - its color-change - the plants tend to display blueish hues in colder climates. Blue Velvet by Dutch Passion is reasonably easy to grow and can eat quite good, so feed her well and she will reward you with a generous amount of fine weed. The smoked end product has a floral, fruity taste and its THC level of 18-19% strikes with an euphoric and uplifting high. A truly recommended revival of a very potent old classic.